Take 1 sp.of Dhania,1sp Jeera,make it powder(raw). Take one fourth kg say 4 to 5 Tomatoes,washed and make a Juice in Mixie(Blender). Pace aa vessel on the Stove,add 2 sp Oil,1 sp Mustard seeds ,one pinch Methi seeds,2 nos Red Mirchi (made into slits),Curry leaves . When it splutters add the Tomato Juice (puried/ grinded)in to it,approximately the Tomato juice will be 2 glasses. Then add 2 more glasses of Water into the Vessel,add 1 spoon of Salt & Tamarind paste1 tspor Tamarind( half of the size of a lime),Dhania powder,and Jeera powder,and also add Garlic Flakes 5 to 6, Curry leaves Corriander leaves,let it boil for 2o mins. 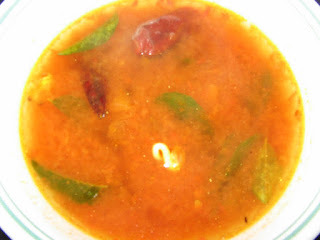 This rasam will be some what OrangishPink in Colour.